Snippets of Jack: "The Black Pearl In A Bottle"
"The Black Pearl In A Bottle"
In Pirates of the Caribbean: On Stranger Tides Jack has again lost the Black Pearl. I don't really understand how he can keep loosing something as big and grand as a ship. Jack: "What has become of my beloved Pearl?" Barbossa: "I lost the Pearl as I lost my leg." Jack: "Lost the Pearl?" Barbossa: "Aye. I defended her mighty enough but she sunk nonetheless." Jack then charges at his frenemy, stomping over the table and knocking over food. Some of the British soldiers have to hold him back. Jack: "If that ship should be sunk properly, you should be sunk with it." Some captain you are Barbossa. 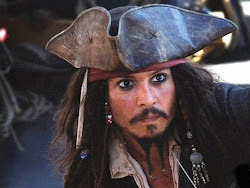 Of course, Jack can't really talk because when the Kraken attacks the Pearl in The Pirates of the Caribbean: Dead Man's Chest, Jack rows away from his ship. Aboard the Queen Anne's Revenge, Angelica takes Jack to a secret part of the ship. Angelica: "He Keeps each ship as a prize. You help me, and I promise you your pick, though I think I know the one you will choose." Jack: "The Black Pearl in a Bottle? Why is the Black Pearl in a bottle? He (the monkey) is even more annoying in miniature." "Taken, not lost. We were off the coast of Hispaniola when we came under attack. No provocation or warning or parley. We were peppered with cannon fire. And then the sea beneath the Pearl began to roil. The Pearl was pitching a yawing violently. Every plank every rail, every spar at once began to creak. The rigging had come to life. Our own ship turned against us, tangling the crew, wrapping around them like snakes. And wrapping around me leg, but me arms were free and my sword was to hand. I am the master of me ship, not Blackbeard. I am the master of my fate, not Blackbeard. So I did what I needed done. I survived." Cutting off your own leg is a little morbid, but at least it gives you a handy place to store your rum!